The story of Ben Kerensa, the loutish and violent Antifa activist who conspired with others to attack citizen journalist Mike Strickland to violently prevent him from filming a Don’t Shoot Portland/Black Lives Matter protest in 2016, has taken yet another – ironic – turn. You’ll recall that Strickland was attacked by ‘protesters’ who, according to court testimony, conspired to confront and attack the successful YouTuber who kept a close and skeptical eye on Portland’s protest culture. Strickland covered Portland’s Professional Protesters, Inc.™* for years without incident. On July 7, 2016, however, activists decided Strickland needed to go. They surrounded Strickland and hit him with, among other things, Antifa flag sticks to harm and intimidate him and push him away from the protest. Kerensa led this effort. Strickland filmed throughout the attack and afterwards. When multiple activists came back to attack him again, Strickland, a licensed conceal/carry permit holder, drew his pistol. No shots were fired and no one else, except Strickland, was hurt. Strickland, a well-trained gun owner, showed a poised discipline and never let his finger get close to the trigger. For defending himself against a band of thugs bent on stopping him from performing a First-Amendment-protected activity, Strickland was arrested, jailed and convicted for drawing his weapon. His case is on appeal. Four months later – four months! – and mere days after the days’ long violent anti-Trump protests seen on national news, yet another nation-wide, orchestrated ‘protest’ was planned in Portland concerning the Dakota Pipeline. Kerensa was filming the protest that day and was told by a Portland Police sergeant that it was illegal to film a cop. That’s patently untrue and Kerensa knew it. He filed a complaint against the sergeant. Though cops are allowed to lie to the public – what, you didn’t know that? – the officer, who claimed he lied to de-escalate the protest, an understandable move after an avalanche of violent protests, was found to have to have violated the spirit of truthiness (or something) required by the Citizens Oversight Board. In January of 2018, the ironically-named Police Chief, Danielle Outlaw, ratified the findings of the Board. Committee members said they were perplexed by the captain’s reasoning for her finding, even though Sgt. Erin Smith acknowledged he misrepresented the law to get protester Benjamin Kerensa to stop videotaping him during a Nov. 30, 2016 demonstration in front of fuel storage facilities in Northwest Portland over the Dakota Access Pipeline. It is a First Amendment protected activity to film protests, something Kerensa violently ignored only four months before. But, just as Portland Judge Thomas Ryan did before in the Strickland case, the Review Committee ignored reality to take the word of an Antifa thug, bomb hoaxer, police impersonator and violent felon over the word of a cop, whose job we thought was to protect people from violent people like Benjamin Kerensa. Let’s leave the Committee’s idiocy aside for a second and go to my main point of this post. The ironic and retch-inducing cant of this thug cannot be overstated. Four months after he attacked Strickland for filming a protest and violently deprived him of his First Amendment rights, Kerensa himself was filming a protest and piously stood on the Constitution for his right to film a protest and a cop. One got the support of Portland leadership. The other didn’t. Strickland was jailed for defending himself against a Kerensa-led violent mob bent on beating him again. Kerensa is viewed as some sort of freedom fighter and is embraced by the ACLU (which never lifted a finger to help Strickland). As I’ve chronicled here and will continue to do, Kerensa’s bizarre attempts to reinvent himself into a public do-gooder reveal him as a fabulist and dangerous man. Now the convicted bomb threat hoaxer, hacker, thug and police and FBI impersonator has reinvented himself into a practicing Muslim. In a little noted story one year ago, Politico reported that Department of Homeland Security “confidential intelligence” documents showed that “antifascists,” known as “Antifa,” are now considered a domestic terror group. Portlanders have watched in disgust as the City ‘leaders’ have thrown their lot in with the protesters, leaving law-abiding citizens adrift without representation. The rule-of-law has become a two track system – one for Antifa and Portland Professional Protesters and the regular, tougher one for everyone else. You’d think that after the nine-year-long blockbuster investigation of Oregon based eco and animal terrorists known as “The Family” that local leaders would catch a clue. Wrong. Either in thrall of ACLU and Lawyers Guild attorneys, or out of fear for their own safety – or both – city officials have looked the other way all while making public pronouncements about the virtue of Antifa’s crusade. Maybe it’s the contact high outside City Hall that convinced them capitulation would keep the mob from their door. Oh, look, someone’s at the door. 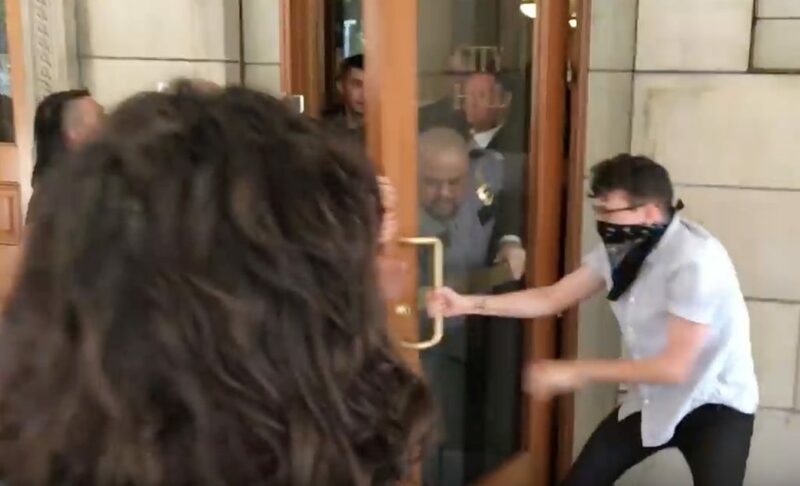 Antifa storms Portland City Hall to protest police stopping their violence at Patriot Prayer ‘free speech’ rally. Antifa has responded to Official Portland’s endorsement by bashing heads, detonating IEDs, setting fires, hitting people with ‘flag’ staffs, hurling fire works, menacing, attacking cops, blocking freeways and roads, conspiring against videographers (see Mike Strickland and Leo Stratton stories nearby), and deploying chemical sprays. Official Protester Portland has given the mob its seal-of-approval because, after all, these virtuous, Black bloc, balaclava clad crusaders ridding the world of all things “fascist” are on the side of angels don’t ‘cha know. Oregonians are wary of coming downtown, especially at night, because they’re afraid to discover they’ve been transmogrified into a Nazi and be ‘dealt’ with by Antifa. Mayor Ted Wheeler has cheered the violent protesters on, offered them public support and ordered police to stand down during violent clashes except once, and that was only recently. However, what is new is the seriousness with which at least federal law enforcement will potentially treat the violent political gang. The report, called the Baseline Comparison of US and Foreign Anarchist Extremist Movements, reported that during 2013 and 2014 things began to heat up in both Michigan and the PNW with violent groups. A group then known as the Plockers, an outgrowth of 2011’s Occupy Portland, began to squat in foreclosed houses and refuse to leave. According to the report, there were multiple arsons committed by these activists in their anti-gentrification schemes. As we’ve seen over the years and chronicled here and on my radio shows, the same people who were active in the “BushHitler” days, became Obamabots and Bernie Bros. Others on the fringes learned from the Seattle WTO conflagration and thus became a subset of these anarchists, wearing their Black bloc clothing and balaclavas. Antifa derived from this group. Portland anarchists have told me they don’t share Antifa’s world view, but for most, it’s a distinction without a difference. The report worries that “anarchist extremist” “antifascists” – come on guys, you can just call them Antifa – will become more violent in the U.S. and the world. Read the report for yourself and note that the deep dive into Antifa ended in spring of 2016 as Antifa was getting absolutely triggered over the presidential election just months away. In July of 2016, Portland Professional Protester members held a “Don’t Shoot PDX” Black Lives Matter march and rally and noticed videographer Mike Strickland in their midst. Strickland, the owner of the YouTube channel, “Laughing at Liberals,” often covered Portland’s Leftist rallies and marches. His material regularly made national news. Organizer of the event, John Slaughter, admitted in court that he and others conspired to rough up Strickland and throw him out of their event, which was being held on a public street. They hit Strickland with their flag staffs, punched him and then, when they saw he had retreated to another spot at the rally, organized another rush at him whereupon he pulled his legal pistol and, while not even putting his finger near the trigger, held off the gang. No shots were fired. Strickland was arrested, charged and put on trial, jailed and his case will be heard on appeal next month. Repeating. 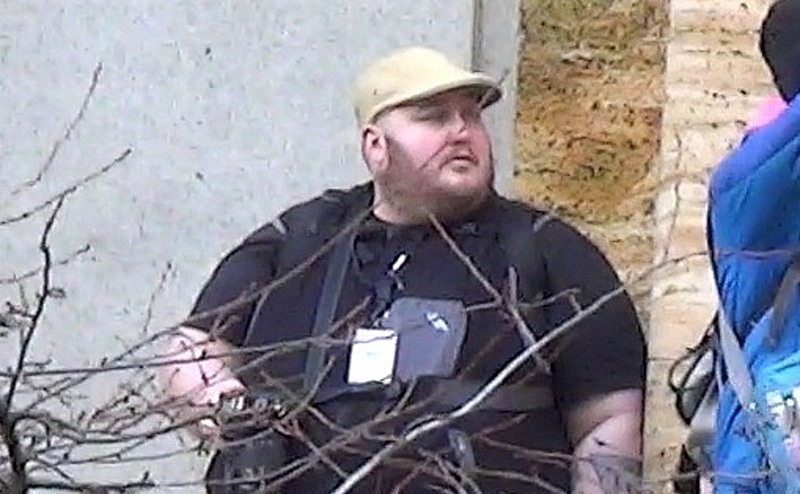 In Portland, Oregon the guy who was doing his job in what we thought was a free country, reporting on protesters on a public street whom he has covered many times before, was forced to pull his pistol to defend himself against a marauding band of thugs, one of whom, Benjamin Kerensa, was 400 pounds. And Strickland was jailed. The chief reason why Strickland was treated like a criminal by the Multnomah County DA’s office? Slaughter claimed, without providing proof, that Strickland sent him racist text messages. Strickland text messages were never presented to buttress that claim because they didn’t exist. But the DA believed Slaughter and poured on the charges and bail for Strickland. Within months of the Strickland assault, similar tactics were used to silence conservative speakers on college campuses. The flaccid response by police and university officials, largely due to their endorsement of their Antifa heroes, gave rise to the right wing groups holding marches and rallies to draw out Antifa and respond to their violence with force of their own. Dozens of armed anti-fascist groups have emerged, including Redneck Revolt and the Red Guards, according to the reports and interviews. One report from New Jersey authorities said self-described antifa groups have been established in cities including New York, Philadelphia, Chicago and San Francisco. Some of the DHS and FBI intelligence reports began flagging the antifa protesters before the election. That means that with federal law enforcement involved could be designated a continuing criminal enterprise and those in it charged with giving material support to a terrorist organization. For real victims, that means that there is another avenue for justice outside the Leftist Multnomah County Courthouse. And that means the possibilities of civil rights violations charges against Antifa and the system of justice that rewards their violence with light sentences and low bail. To sum up: Antifa is a violent, anarchistic group, with national and international ties, that uses violence and destruction as a weapon of terror. The Pacific Northwest is the biggest hotbed of this activity. If Portland, Oregon is ground zero, Mike Strickland was patient zero. Give here to his defense fund.